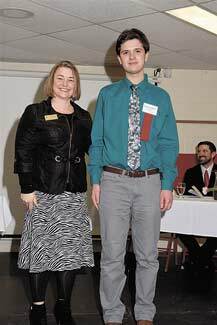 Ben Kubisiak of Rhinelander was presented with a Herb Kohl Excellence Award and $10,000 Scholarship at the Herb Kohl Educational Foundation Recognition Luncheon on Sunday, March 31. Ben was accompanied at the luncheon by his family and Rhinelander High School Principal Shane Dornfeld. Ben will be attending St. Norbert College in the fall majoring in History. His high school activities included Drama, Mock Trial, Student Council and Teen Court. According to a Herb Kohl Foundation press release, Student Excellence Scholarship recipients have demonstrated excellence in the academic arena and high motivation to achieve, have displayed a broad range of activity and leadership outside the academic setting, and have shown strong promise for succeeding in college and beyond.